According to the Renewable Sources EU Directive 2001/77/CE, the Italian Government goal is to attain the share of 22% in RES electricity production in 2010. In such context it becomes crucial to explore the existence of consumer's Willingness to Pay (WTP) in order to use renewable energy in the electricity production. This study is based on a national survey with 1601 interviews made, in Italy, in November 2006. My aim is twofold. Firstly, I wish to assess the consumer's WTP which is the basis for market sustainability of such energy policy goal and, secondly, I evaluate the share of the necessary public support to RES policy which is covered by the aggregate WTP of Italians. This is an implicit assessment of the plausibility/acceptance of the announced target policy. In my survey framework I obtain the consumer's WTP with two different approaches and to this end the sample has been divided in two parts. In the first sub-sample I propose the full price vector with a downward elicitation format while in the second sub-sample I use the same price vector with an upward elicitation format. In this paper I focus on the different uncertainty degree that affects respondent's choices. I take care econometrically of this issue using an individual stochastic valuation approach and a referendum approach. I obtain for most of the estimated models that estimates of WTP are in agreement with other international results. The aggregate WTP for RES in Italy, however, is (still) not enough to attain the Italian Government goal in 2010. Proceedings - Consumer’s willingness to pay for green electricity: a meta-analysis of the literature. 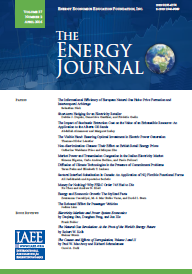 Published in Volume 30, Number 2 of The Quarterly Journal of the IAEE's Energy Economics Education Foundation.